Donna and the Bears: Let's Make This Hat Pincushion! Let's Make This Hat Pincushion! This is not intended to teach you how to crochet, but rather to offer a suggestion for turning a little hat into a tiny gift of a pincushion. I have found so many helpful videos on YouTube and know that you will find just the basic instructions there for any technique you could need. Do email me at the address listed on this page and put "hat pincushion" in the subject line if I can clarify anything for you. 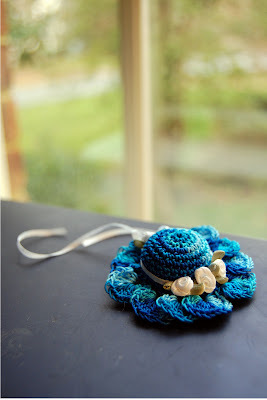 Making little hats, or any size for that matter, can be very simple. 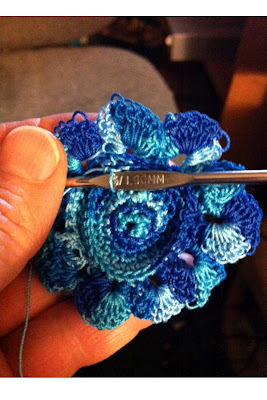 Beginning with a "magic circle" (you can find lovely videos on YouTube for this) make 6 single crochets into the circle. 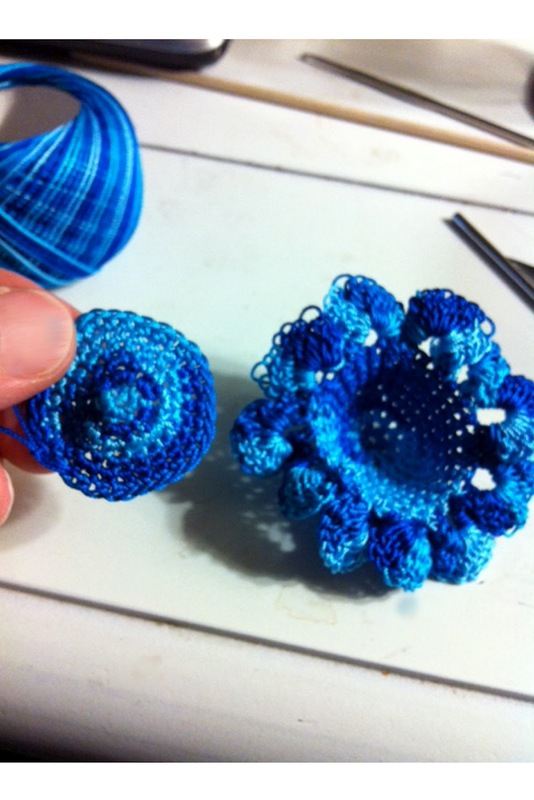 After pulling the circle snug, make successive rounds by adding 6 additional single crochets to each round until the crown of the hat is as wide as you wish it to be. 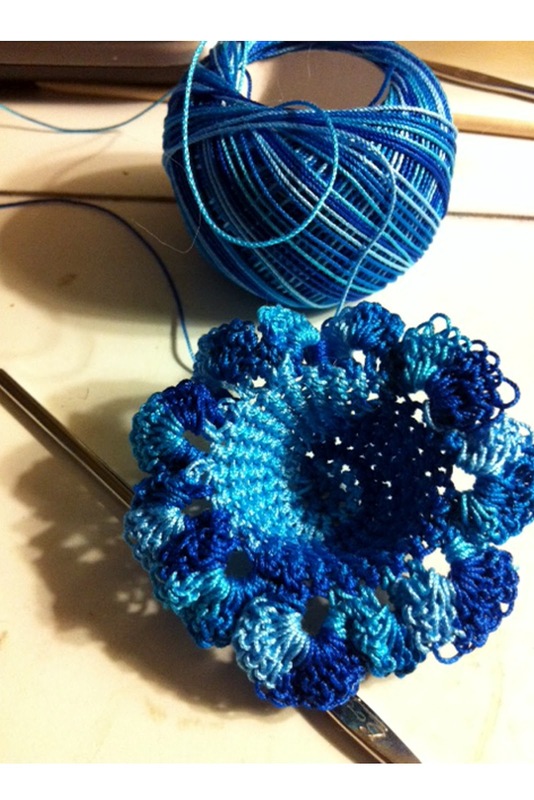 Single crochet into each of the stitches you've created to make the crown as deep as you want and then add the brim. 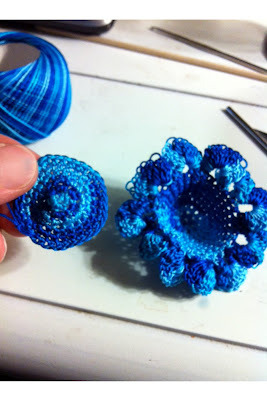 There are many YouTube videos for making flowers - so add a brim using one of these groups of stitches. The thread I'm using here is called Lizbeth - size 10 - in Peacock Blues. The crochet hook is size 5 /1.90mm. Once the hat is completed, crochet another piece just as you began the hat - making the circle the same size as the bottom opening. Using either single crochet or slip stitch, join the flat circle to the opening. 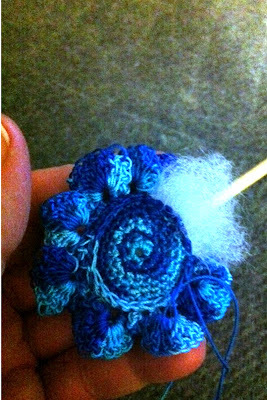 Just before you get all the way round, add stuffing of your choice to create the filler for the pin cushion. Then, finish closing up the opening. Now all you have to do is add some trims - tiny flowers and ribbons - and box it up to give it to a special friend!! Here's a seasonal variation using embroidery floss for the crown of the hat and a fluffy white thread for a trim. I've used crystals for an accent. I always have special friends in my workroom! 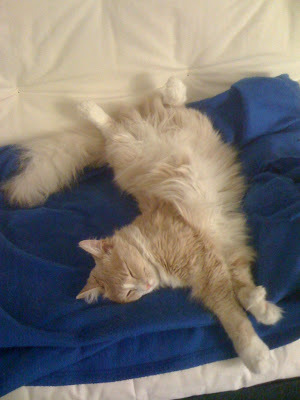 Rocky, my kitty with "thumbs," loves relaxing on my Snuggie!! That is the sweetest little pin cushion. Glad you like it!! I hope to get lots more done for gifts. I think they are very sweet and a good place for just a few pins! very clear photos, i will try this after finishing my work, not sure i can make the borders, will follow the link you described. If you can't find a similar pattern, Susana, email me and I will give you the directions to the brim that I made for the little hat in the photo. Youtube is great, though, for clear videos on doing just about everything! !